Boost.MPI provides an alternative MPI interface from the Python programming language via the boost.mpi module. The Boost.MPI Python bindings, built on top of the C++ Boost.MPI using the Boost.Python library, provide nearly all of the functionality of Boost.MPI within a dynamic, object-oriented language. The Boost.MPI Python module can be built and installed from the libs/mpi/build directory. Just follow the configuration and installation instructions for the C++ Boost.MPI. Once you have installed the Python module, be sure that the installation location is in your PYTHONPATH. I am process 1 of 5. I am process 3 of 5. I am process 2 of 5. I am process 4 of 5. I am process 0 of 5. There are only a few notable differences between this Python code and the example in the C++ tutorial. First of all, we don't need to write any initialization code in Python: just loading the boost.mpi module makes the appropriate MPI_Init and MPI_Finalize calls. Second, we're passing Python objects from one process to another through MPI. Any Python object that can be pickled can be transmitted; the next section will describe in more detail how the Boost.MPI Python layer transmits objects. Finally, when we receive objects with recv, we don't need to specify the type because transmission of Python objects is polymorphic. When experimenting with Boost.MPI in Python, don't forget that help is always available via pydoc: just pass the name of the module or module entity on the command line (e.g., pydoc boost.mpi.communicator) to receive complete reference documentation. When in doubt, try it! Boost.MPI can transmit user-defined data in several different ways. Most importantly, it can transmit arbitrary Python objects by pickling them at the sender and unpickling them at the receiver, allowing arbitrarily complex Python data structures to interoperate with MPI. Boost.MPI also supports efficient serialization and transmission of C++ objects (that have been exposed to Python) through its C++ interface. Any C++ type that provides (de-)serialization routines that meet the requirements of the Boost.Serialization library is eligible for this optimization, but the type must be registered in advance. To register a C++ type, invoke the C++ function register_serialized. If your C++ types come from other Python modules (they probably will! ), those modules will need to link against the boost_mpi and boost_mpi_python libraries as described in the installation section. Note that you do not need to link against the Boost.MPI Python extension module. Finally, Boost.MPI supports separation of the structure of an object from the data it stores, allowing the two pieces to be transmitted separately. This "skeleton/content" mechanism, described in more detail in a later section, is a communication optimization suitable for problems with fixed data structures whose internal data changes frequently. The following module-level functions implement MPI collectives: all_gather Gather the values from all processes. all_reduce Combine the results from all processes. all_to_all Every process sends data to every other process. broadcast Broadcast data from one process to all other processes. gather Gather the values from all processes to the root. reduce Combine the results from all processes to the root. scan Prefix reduction of the values from all processes. scatter Scatter the values stored at the root to all processes. Boost.MPI provides a skeleton/content mechanism that allows the transfer of large data structures to be split into two separate stages, with the skeleton (or, "shape") of the data structure sent first and the content (or, "data") of the data structure sent later, potentially several times, so long as the structure has not changed since the skeleton was transferred. The skeleton/content mechanism can improve performance when the data structure is large and its shape is fixed, because while the skeleton requires serialization (it has an unknown size), the content transfer is fixed-size and can be done without extra copies. To use the skeleton/content mechanism from Python, you must first register the type of your data structure with the skeleton/content mechanism from C++. The registration function is register_skeleton_and_content and resides in the <boost/mpi/python.hpp> header. Of course, this transmission of content can occur repeatedly, if the values in the data structure--but not its shape--changes. The skeleton/content mechanism is a structured way to exploit the interaction between custom-built MPI datatypes and MPI_BOTTOM, to eliminate extra buffer copies. Boost.MPI is a C++ library whose facilities have been exposed to Python via the Boost.Python library. Since the Boost.MPI Python bindings are build directly on top of the C++ library, and nearly every feature of C++ library is available in Python, hybrid C++/Python programs using Boost.MPI can interact, e.g., sending a value from Python but receiving that value in C++ (or vice versa). However, doing so requires some care. Because Python objects are dynamically typed, Boost.MPI transfers type information along with the serialized form of the object, so that the object can be received even when its type is not known. This mechanism differs from its C++ counterpart, where the static types of transmitted values are always known. In the future, Boost.MPI will be extended to allow improved interoperability with the C++ Boost.MPI and the C MPI bindings. The Boost.MPI Python module, boost.mpi, has its own reference documentation, which is also available using pydoc (from the command line) or help(boost.mpi) (from the Python interpreter). The design philosophy of the Parallel MPI library is very simple: be both convenient and efficient. MPI is a library built for high-performance applications, but it's FORTRAN-centric, performance-minded design makes it rather inflexible from the C++ point of view: passing a string from one process to another is inconvenient, requiring several messages and explicit buffering; passing a container of strings from one process to another requires an extra level of manual bookkeeping; and passing a map from strings to containers of strings is positively infuriating. The Parallel MPI library allows all of these data types to be passed using the same simple send() and recv() primitives. Likewise, collective operations such as reduce() allow arbitrary data types and function objects, much like the C++ Standard Library would. The higher-level abstractions provided for convenience must not have an impact on the performance of the application. For instance, sending an integer via send must be as efficient as a call to MPI_Send, which means that it must be implemented by a simple call to MPI_Send; likewise, an integer reduce() using std::plus<int> must be implemented with a call to MPI_Reduce on integers using the MPI_SUM operation: anything less will impact performance. In essence, this is the "don't pay for what you don't use" principle: if the user is not transmitting strings, s/he should not pay the overhead associated with strings. Sometimes, achieving maximal performance means foregoing convenient abstractions and implementing certain functionality using lower-level primitives. For this reason, it is always possible to extract enough information from the abstractions in Boost.MPI to minimize the amount of effort required to interface between Boost.MPI and the C MPI library. There are an increasing number of hybrid parrallel applications that mix distributed and shared memory parallelism. To know how to support that model, one need to know what level of threading support is guaranteed by the MPI implementation. There are 4 ordered level of possible threading support described by mpi::threading::level. At the lowest level, you should not use threads at all, at the highest level, any thread can perform MPI call. 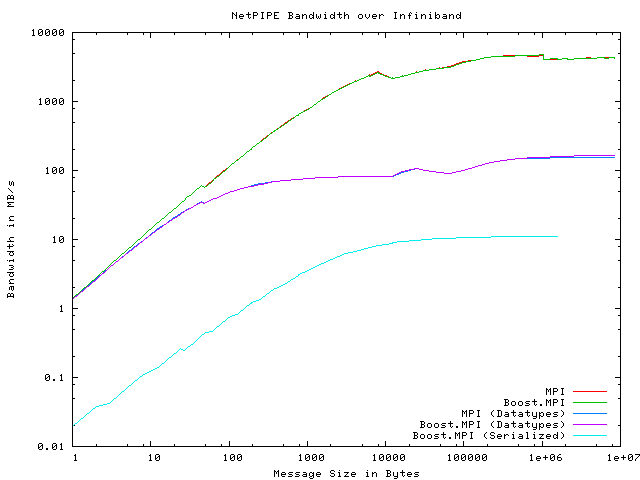 MPI: The unmodified NetPIPE benchmark. Boost.MPI: NetPIPE modified to use Boost.MPI calls for communication. MPI (Datatypes): NetPIPE modified to use a derived datatype (which itself contains a single MPI_BYTE) rathan than a fundamental datatype. Boost.MPI (Datatypes): NetPIPE modified to use a user-defined type Char in place of the fundamental char type. The Char type contains a single char, a serialize() method to make it serializable, and specializes is_mpi_datatype to force Boost.MPI to build a derived MPI data type for it. Boost.MPI (Serialized): NetPIPE modified to use a user-defined type Char in place of the fundamental char type. This Char type contains a single char and is serializable. Unlike the Datatypes case, is_mpi_datatype is not specialized, forcing Boost.MPI to perform many, many serialization calls. There are a some observations we can make about these NetPIPE results. First of all, the top two plots show that Boost.MPI performs on par with MPI for fundamental types. The next two plots show that Boost.MPI performs on par with MPI for derived data types, even though Boost.MPI provides a much more abstract, completely transparent approach to building derived data types than raw MPI. Overall performance for derived data types is significantly worse than for fundamental data types, but the bottleneck is in the underlying MPI implementation itself. Finally, when forcing Boost.MPI to serialize characters individually, performance suffers greatly. This particular instance is the worst possible case for Boost.MPI, because we are serializing millions of individual characters. Overall, the additional abstraction provided by Boost.MPI does not impair its performance. 2006-09-21: Boost.MPI accepted into Boost. Boost.MPI was developed with support from Zurcher Kantonalbank. Daniel Egloff and Michael Gauckler contributed many ideas to Boost.MPI's design, particularly in the design of its abstractions for MPI data types and the novel skeleton/context mechanism for large data structures. Prabhanjan (Anju) Kambadur developed the predecessor to Boost.MPI that proved the usefulness of the Serialization library in an MPI setting and the performance benefits of specialization in a C++ abstraction layer for MPI. Jeremy Siek managed the formal review of Boost.MPI.